From the Commuter Review that Moe performed for us, we all know that the 505 is more than capable of being a great commuter bike. Moe also mentioned that it is also a great bike for the trails. Here’s Michael going over some roots with the 505. To make sure that this claim was true, we asked one of our friends, Michael “The Goat” Monte to give the 505 a test run through Fullerton Loop. We call Michael the goat due to the fact the guy climbs….well like a goat! He’s one of the better climbers that I know. 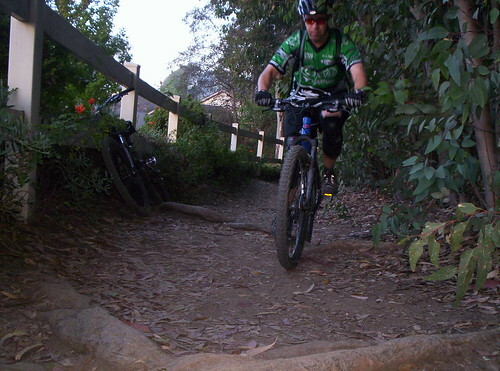 Besides he’s a Hard Tail afficionado that has been very loyal to Specialized bikes. So we wanted to see if he can be swayed to like something other than Specialized. I really enjoyed riding this bike. 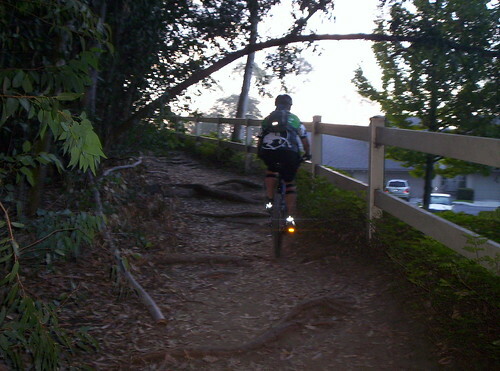 The front fork lockout allowed me to climb a lot easier and faster (and you know that I like to climb!). Even when I forgot to switch them out of lockout mode, I still had a comfortable ride. I thought the tires helped soak up some of the trail’s bumps and dips and did a great job of providing traction. The shorter handlebar stem along with the bike’s geometry allowed me to have better control and provided better handling. After using the disc brakes, I now know that this will be my next big purchase. They truly inspired confidence and helped me feel more comfortable on the downhills and more technical parts of the trail. The shifting was much smoother than what I am used to, especially the “hair trigger” feel of the shifter next to my thumb. The WTB Rocket V seat was so comfortable that I forgot that I was sitting on it. This is a bike that I am looking forward to riding again! You can even watch a short video clip to show the 505 in action! To learn more about the Woodstock 505, check out our review or go directly to their SITE.